The US Navy has long ruled the oceans securing and protecting our liberty. Show your support for the sacrifices and skills of those who serve our country in waters nearby and those around the globe with the US Navy personalized Christmas ornament featuring a battleship and the flag. These are part of a series of military ornaments personalized by our lettering pros that honor each branch of the armed forces. An attractive display cord is included, so the ornament can be placed wherever it brings the most pride. 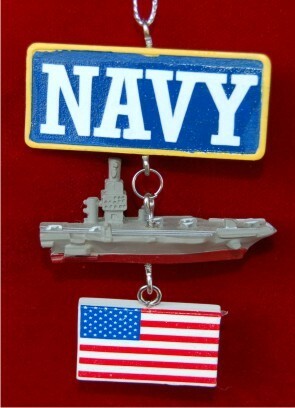 Show your support or offer tokens of appreciation to active duty sailors, reserve and veterans too with the Navy battleship and flag personalized Christmas ornament from Russell Rhodes.